Learn about ornithology, marine biology, data recording, citizen science and seabird conservation. Do you like looking at all the wildlife from your boat? Then join the "SeaBC" seabird count. It's like a Backyard Bird Count (BBC), but where your backyard is the sea around your boat! Scientists and conservation groups need your sightings from out on the water. There are so many unanswered questions about ocean birds. Where do some species breed? Where do they spend the winter? Where do they travel? You can help add a piece to the puzzle, helping conserve these birds when it comes time to protect their habitat or decide where to place an ocean wind farm. It's a great project if you're home-schooling aboard. Learn about ornithology, marine biology, data recording, citizen science and seabird conservation. 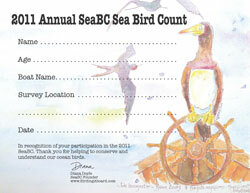 Young birders receive a colorful personalized PDF certificate of participation with original seabird artwork. Participation is easy. Choose your day in December and count all the birds you see from your boat while transiting for one hour, a few hours, or an entire day. Information and tally sheets are available at Facebook.com/Birding.Aboard (click on SeaBC/Resources), where you can also share your birding aboard photos and sightings. Please join the count and help ocean birds! Parents: Get Your Child Involved in Seabird Citizen Science! Even if you don’t consider yourself a birder, here are some tips to help you or your home-schooled child identify what you see. 1. Purchase a field guide or field guide app for your area. A list is available on BirdingAboard.com under "SeaBC/Resources." 2. Teach your child to take notes or draw sketches, learning to observe and record nature. Identification can come later. 3. Ask locals. Their knowledge of nature usually far surpasses what’s available in field guides or even web searches! 4. Submit your sightings to Cornell’s eBird database so it can be used to help bird conservation and study trends <ebird.org>. This is a great on-line activity for home-schoolers.